Birds (class Aves or clade Avialae) are feathered, winged, two-legged, warm-blooded, egg-laying vertebrates. Aves ranks as the tetrapod class with the most living species, approximately ten thousand. 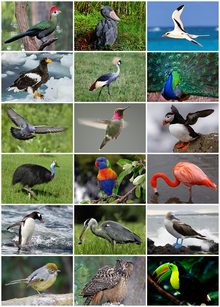 Extant birds belong to the subclass Neornithes, living worldwide and ranging in size from the 5 cm (2 in) Bee Hummingbird to the 2.75 m (9 ft) Ostrich. The fossil record indicates that birds emerged within the theropod dinosaurs during the Jurassic period, around 150 million years ago. Most researchers agree that modern-day birds are the only living members of the Dinosauria clade.— Excerpted from Bird on Wikipedia, the free encyclopedia. Sorted by order (with broad example). On the Misdeeds of the House-Sparrow (Passer domesticus), 1887 by John Henry Gurney Jr.
Passer domesticus in Bird-Lore, Vol. I, 1899. On a Goldfinch Starved to Death in his Cage by William Cowper (1731–1800). Spinus tristis in Bird-Lore, Vol. I, 1899. Spizella passerina in Bird-Lore, Vol. I, 1899. Plate XLIV of Vesper Sparrow for Bird-life; a guide to the study of our common birds, 1897. Boulder, Colorado, March 23, 1909, Field Notes of Junius Henderson, Notebook 3. Sitta carolinensis in Bird-Lore, Vol. I, 1899. Poecile atricapillus in Bird-Lore, Vol. I, 1899.